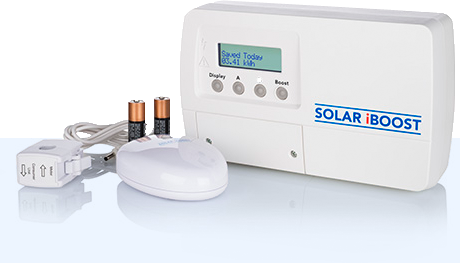 Uses your PV array to give you FREE hot water with the Solar iBoost! The Solar iBoost uses the surplus solar PV energy generated at your home to heat the hot water in your household water tank and save you money. Fit a Solar iBoost and watch your water heating bills fall! Solar iBoost uses ONLY energy that would be exported, allowing you to use as much of the free energy that, unless you have an export meter, you are paid for anyway! The Solar iBoost is the easiest to fit, use and monitor device, enabling you to enjoy even more financial benefits from your PV solar investment. The Solar iBoost concept is to use the surplus solar PV energy generated at your home to heat the hot water in your household water tank and save you money. Solar iBoost does not affect your FIT generation payments. Where you have a “deemed” usage contract with your FIT provider you will be paid for the export value regardless of whether the energy is consumed or not. This is normally based in 50% of the generation reading and will not be affected. Where an export meter is fitted with the benefits of the Solar iBoost can still easily outweigh the rising energy costs of water heating.